I'm Joe and i am a freelance full-stack developer specialising in Android app development. I have been programming full-time for over 6 years and worked on apps for many house-hold names including GlobalRadio (Capital FM, Heart), AbinBev (Heineken, Budweiser) and Public Health England as well as many start-ups and independent clients on various well reviewed products. While Android is technically my speciality it is rare that I am ever working solely on the mobile side of things. I have also developed admin control panels in PHP, REST apis in both Node.js and PHP, feed parsers in GO and even designed logos, websites and general user interfaces. So please do still get in touch no matter the type of project! Quality, straight to the point communication is one of my top priorities as well as keeping up to date with the latest development tools and practices. I work full-time from my home office in Oxford and ready to get going on any project immediately. 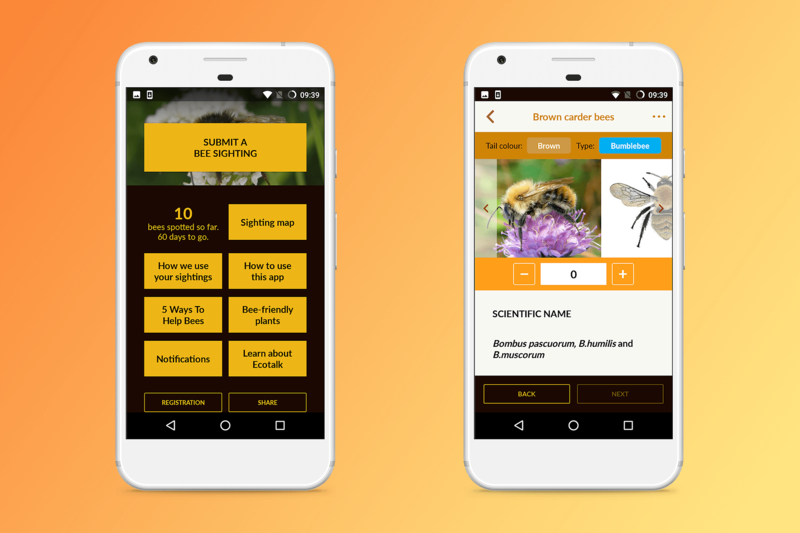 The Great British Bee Count app (GBBC) is a free app built for Friends of the Earth in collaboration with a varying collection of partners including Waitrose in 2017 and The Peoples Postcode Lottery in 2018. The GBBC app opens its doors once a year to rally the British people in the fight to save the dwindling global bee population. Users can record bee sightings with photos, get tips on making their garden a bee friendly environment and simply learn more about the many different breeds of bee out there. Starting in 2017, working with TwoThirdsWater I was tasked with updating the existing GBBC app to provide an all new user interface as well as various bits of additional functionality. Including adding a sighting map, user registration and the ability to access the bee identification guide when the app is "closed" off-season. In 2018 I was again asked to work on the app to make further updates to the user interface, add a new on boarding flow and tailor the sighting screens to provide more data for Friends of the Earth's crack bee scientists.